Most of what needs to be known about the suicide of internet activist Aaron Swartz has been written in the hundreds of stories easily found on the internet. I commend them all to you because there is surprisingly little duplication and a great deal of evidence explaining why so many privileged and educated people in the US now fear rather than respect its criminal justice system. Indeed if any good is to come out of this case (which is, in itself to be doubted), it will be in greater public scrutiny of a criminal justice system that has long been out of control. Few of the facts in the Swartz case are in dispute. Swartz admitted he illegally downloaded hundreds of scholarly articles from JStor via a net-book which was surreptitiously connected to a mainframe at MIT that supports access to its library’s subscription services. Upon discovery of the hack by the private security employed by MIT, the case was turned over to the police service of the city of Boston who then--and here it gets a big vague--gave it over to the secret service of the US federal government. Why the secret service involvement? According to the mission outlined on the website of the US secret service, their agents get involved when there is signiﬁcant economic or community impact, organized criminal groups involving multiple districts or transnational organizations are involved or a criminal scheme involves new technology. What Swartz did has nothing to do with their self stated mission. However since 9/11, the various pieces of badly drafted legislation passed in the Bush presidency to ﬁght terrorism have allowed agency mission creep of considerable proportions. Indeed, on a quiet day at the Boston division of the secret service why not have a nosy around incidents at MIT. Maybe that is all that happened; or perhaps a source at MIT called their ofﬁce, the service peoplehad nothing better to do and the rest, as they say, is charges of 35 years in prison. Te secret service involvement did not prevent JStor (the injured party) from refusing to press charges, once it understood the nature of the hack. However, MIT, where the hack took place, was not as clear-minded and its managers dithered. Perhaps this dithering encouraged the secret service to further involvement and taken together led the federal prosecutor for this district, the US district attorney Carmen M Ortiz, to believe the case had greater importance than it had--all of which is pure speculation. As a result, any link between this suppression of secret service involvement and the vigor with which the US district attorney for Massachusetts (Carmen Ortiz) pursued the case against Swartz is impossible to assess. However, her zeal does stand in strong contrast to the general tenor of prosecutorial life under the agency’s leader, Attorney General Eric Holder. He has generally preferred settling out of court and nearly all the white collar crimes of the Wall Street Banksters have been settled rather than tried. This contrast between prosecutorial zeal at the district level and lassitude at the federal level is even more odd when one considers Ortiz and Holder have known each other since the early 1980s when the pair worked together on Abscam (a convoluted FBI sting operation aimed at prosecuting inﬂuence peddling by state and federal ofﬁcials). Moreover, more than anyone Eric Holder is responsible for Ortiz’s appointment as the Massachusetts District Attorney. One would have thought the reason for choosing her was his expectation she would share his stance towards plea bargaining rather than jailing white collar criminals. In the Swartz case, Ortiz acted opposite to his general stance and that is what draws attention. It is as if no amount of schooling in the law, in life and in court is allowed to diminish the simple-minded clarity of a rather simple-minded prosecutor. Bit of a shock to realize she might very well believe what she said despite the fact there was no victim: JStor acknowledged, after the fact, the need to make academic papers more easily available to the public taxpayers who paid for most of their production. The authors of those papers had long ago given over their copyright to the publisher, as a condition of publication. And the publishers long ago gave ownership of the papers to JStor. No one was injured. It would be easy to attribute the actions of Ortiz to some grand federal plan to prevent digital piracy at any cost. However the facts in the case make a smaller more parochial more pathetic kind of sense. A truculent and rather unsophisticated prosecutor endowed a trivial case with an importance it did not have because important people were involved and because the young offender pissed her off. He pissed her off because he was privileged, smart and spoke truth to power, something she never had the luxury of doing. The lesson here is the banality of the probably motive for the evil actions. Envy with a badge, a gun and privileged access to courts ought to make us all uneasy. Are there any open access lessons in this? You bet. Those of you at universities, go talk to the head librarian about serials prices, see if the librarian has records for the price hikes for the past decade. Ask yourself: how does it happen that what I write/referee/edit is owned by a multinational media conglomerate who charges my university multiples of my salary to read what I and my colleagues have written? Open access matters and there is a duty to ﬁnd out why. 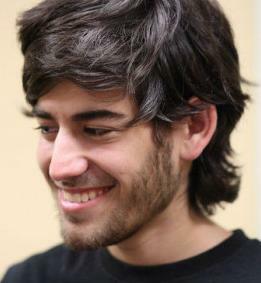 Editor's note: although some delightful images of Aaron Schwartz are available on the web the software used for this website would not allow me to use any of them because of IP restrictions. How sad and desperately ironic.